Of late, even star heroes are going for makeover to play different roles in different genre films. When filmmakers are asking them to have two or more makeovers in physical appearance, they without any hesitation are undergoing special transformation to get into the skin of the character they play in the film. Prabhas had undergone noticeable physical transformation for portraying the two generations of the fictional characters- Amarendra Baahubali and Mahendra Baahubali in Baahubali. Rana too showed variance in his character as Bhallaladeva during his younger days and older days. NTR, Ram Charan, Allu Arjun, Mahesh Babu, Vijay Devarakonda, Sai Dharam Tej, Nithin, Varun Tej etc. tried different looks as per their director’s wish in their recent films. Most recently, Naga Chaitanya stunned one and all with his stunning transformation from a youngster to a middle aged man. While he looked smart and charming as a young cricket player who is deeply in love with his girlfriend, he looked massy and rugged as a married man who has no big goals in life. Chaitu who previously was criticized for picking wrong subjects has been lauded for choosing Majili and also for playing the role with two different shades flawlessly. The film directed by Shiva Nirvana is turning out to be a biggest hit for Chay as solo hero. However, when almost all the heroes are going for makeovers for almost every new film, our Natural Star Nani is not showing much interest to do so. De facto, he worked hard for his upcoming flick Jersey where he will be seen as a youngster and a middle aged man. He took training in cricket to play his shots rights and didn’t care injuries during shoot. But, Nani disappointed movie buffs yet again with routine look for Jersey as well. 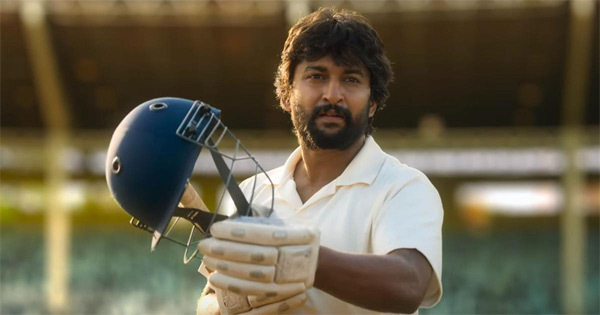 The film’s theatrical trailer that was released recently showed Nani in two shades as a youngster and as a father of a school going kid. There’s nothing change you will find in this character in two different time periods, though the trailer has been getting critical applause. Nani should try different look for his next films which is a need of the hour for him or else audience may get bored to see him in same look next time!